Design Ecologies is organized in five major parts culminating in an emerging design theory entitled ‘Eniatype’. Each article investigates various novel concepts of ecologically informed methodologies of communication through design practice. 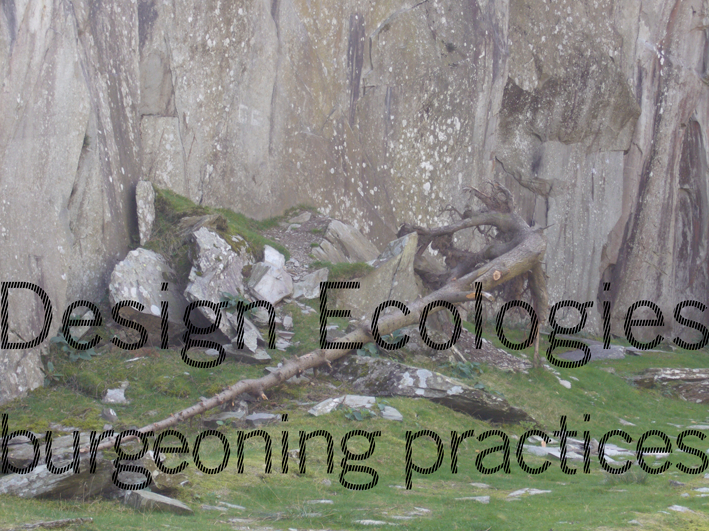 Every article within Design Ecologies will refer back to previous articles in earlier issues as a critique or reflection of the new contributor’s own practice and research. It is hoped that there will be a residue or trace throughout all the issues of Design Ecologies that will guide the reader through the shifting and complex territory of articulating what are ‘design ecologies’? Every issue of Design Ecologies should be read as an ‘Ecology of Ideas’. The first part, ‘Ideation’, describes a history of visionary thinking on methodologies of communicating an architecture along with new models and ecological contributions. Many of the notions on communication and relationships in this work stem from these potent ideations. Methodologies of communication concepts such as ‘Correalism’, ‘reflexive architecture’ and ‘recursive vision’ are introduced. These describe new ways in which design practice, participant and environment interact with each other and as a whole. Correalism concerns the relationship between environment and participants. Reflexive architecture charts the emerging practices whose architectures straddle between realms of the virtual and the actual. Whilst recursive vision is about a framework of thinking which is called ‘an ecology of mind’ or mind in ecological settings. It strives to discover a set of rules from which we can derive principles about the environment, and the relations between human activity and the environment. In the second and third parts, Ecological and Notational, a series of design visions explore these concepts in specific burgeoning practices. This is the investigation of an attempt at moving design practice through environment, to contain a series of principles for describing the design situation as complex and contingent. Articles in this issue include Munro’s ‘Dreaming tongues’, which explores his own design methodologies through a poetic narrative for an island in Japan. More’s article on ‘My persistent world’ is a rearticulation of the relationship between the interfaces with use in designing online environments. The fourth and fifth parts, Instructional and Aesthetical design visions, are a compound synthesis of all three previous articles discussed through practice and research. Robbins’s article informs us about his practice methodologies through informing us ‘how to do something?’ He aims to achieve this through moving forward a design project by reflexing backwards to pick up past trajectories of sound, purposeful attributes and relink our future role of designing something, whilst Moore’s article investigates the principle of understanding design practice through experience. The overall aim of this journal is to profoundly redefine and reshape how the methodologies of communication between research and practice and the environment affect each other. Through a careful restructuring of the professions that influence architectural environments, this declaration is certainly possible. As of now, the limitations in design thinking on various non-integrated professions have spoilt much of the environment. Eniatype is an embryonic far-reaching awareness that crucially bonds the discipline’s design ecologies, theory of notation, instructional design and aesthetics. Still in its nascent stages, it has yet to be entirely defined. As a pragmatic essential meld of multiple disparate sensibilities, it endeavours to rethink the relationship of practising through context, design and communication. Under such a single umbrella influence, a sophisticated ecological view of communication is reified. The need to continually change our surroundings reveals the commonness of architecture as a human activity and its embodiment of the human need to address Eniatype situations. Architectural professionals have extensively researched architectural practice and education in order to continually address greater orders of complexity without an understanding of the role of the Eniatype in architecture. The key research question: What is our understanding of a link between the education of architecture and the Eniatype in architecture? Theories of Eniatype practice are more powerful than most architectural theories because they accurately describe the design situation as complex and contingent. The key research question: Can Eniatype practice provide an alternative epistemology of architecture linked to a new epistemology of architectural practice and education? 3.Produce a methodological framework to guide Eniatype architecture in the design of ecological systems. The key research question: In what form can theories of Eniatype be mobilized in order to create new and effective approaches to architectural education? This journal demonstrates a rethinking of methodologies of communication through ecological design. Human communication and ecological accountability are inextricably linked in architectural design. In fact there are potentially innumerable forms of holistic designs that will connect and shape environments for human communication. Contained within are new design ideations and explorations for prospective models of designing. These conceptions are achieved towards an emergent protean set of collective principles aptly labelled ‘Eniatype’.